Some of us here at Minnkota Power Cooperative have had the opportunity in the last week to test drive our new electric Chevy Bolt around Grand Forks. We're already loving how it handles, all of its innovative features and the smiles and waves we get from passersby. But Thursday was my first chance to take it a little farther and get a feel for the road trip experience. I had a work meeting in Thief River Falls, Minn., which is approximately 60 miles from Minnkota's headquarters. It wasn't a terribly lengthy jaunt, but enough to see how efficient the Bolt would be on the highway, in open wind, navigating a couple of road construction detours (it IS summer in Minnesota) and other things a driver may not run into within city limits. Plus, the people I would be meeting, including representatives from Minnkota's distribution cooperatives and associated municipal utilities, also have an interest in learning more about electric vehicles and spreading that knowledge in their communities. Not a bad day at work, I'd say. I left Minnkota in the morning with a nearly full charge - only 0.8 kWh used over 3.4 miles. 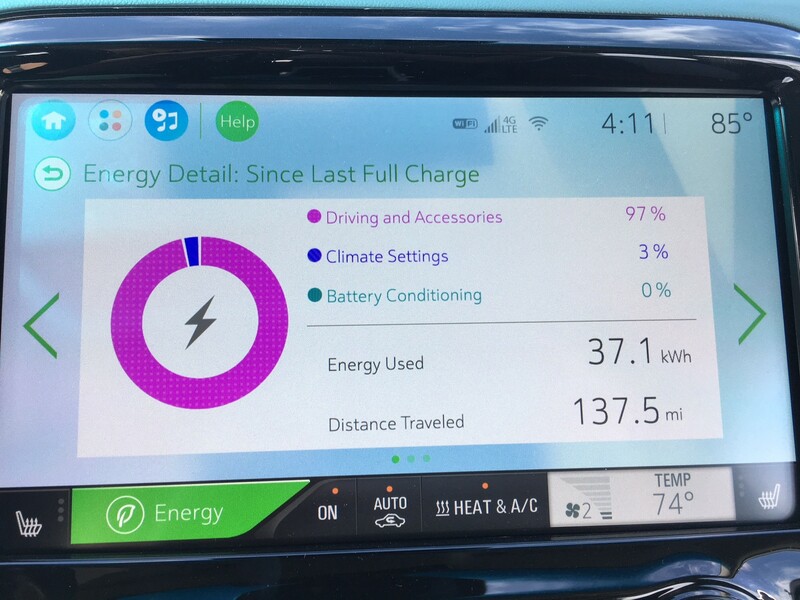 My dash indicated I would likely be able to travel 217 more miles on my charge, with a maximum of 256 miles or a worst-case-scenario 177 miles if I consistently broke the speed limit and blasted the air conditioner the entire time. It was a fairly calm and sunny day, so weather didn't slow me down at all and I arrived at my destination, the Northern Municipal Power Agency, with 17.6 kWh used over 65 miles. My touchscreen told me it expected I would get 146 miles out of my remaining charge - plenty to get me to a couple of additional stops in town and back to Grand Forks without a worry. After a morning of good conversation about energy efficiency, the meeting's attendees wanted a look at the blue and green beauty parked outside. Both Minnkota Power Cooperative and Beltrami Electric Cooperative brought their Chevy Bolts to the meeting in Thief River Falls, Minn., a community that doesn't see many electric vehicles pass through. Luckily, our friends at Beltrami Electric Cooperative in Bemidji, Minn., also brought their Bolt, so there was an opportunity for everyone to take a look under the hood, play with the touchscreen options and see how much legroom the backseat has, which, many were surprised to find, is a lot. Our energy industry partners had a lot of questions about how the car would handle the winter (a big concern for drivers in this area), where the best charging opportunities are and where the technology will head next. The discussion was great, and I can't wait to continue to learn more alongside our cooperatives. Many in our meeting group were intrigued by how the Bolt functioned internally, while others had questions about price, creature comforts and handling. The drive back to Grand Forks was smooth sailing, but I did catch myself more closely monitoring my mileage and driving efficiency. I noted that turning off the climate control completely would give me 10-15 additional expected miles on my gauge, and accelerating to a meet a higher speed limit - when done quickly - would zap a whole lot of kWh. Do you want to know what else zaps energy? Those Red River Valley wind gusts. Yikes! I rolled back into the Minnkota fleet garage with 134 miles traveled and about 36 kWh expended. Ultimately, my remaining mileage expectancy was 77 miles (90-mile maximum and 63-mile minimum), just a few miles less than the Bolt's touted 238-mile range. However, I know there are many ways I can make my next road trip more energy efficient, and I'm eager to give it a shot. This quick trip to Thief River Falls already has me itching to bring our Bolt to more communities to answer your questions about electric cars. Keep an eye out for our team in the months to come!